It's the clash we've all been waiting! It's arguably the biggest and oldest university rugby derby in the world! 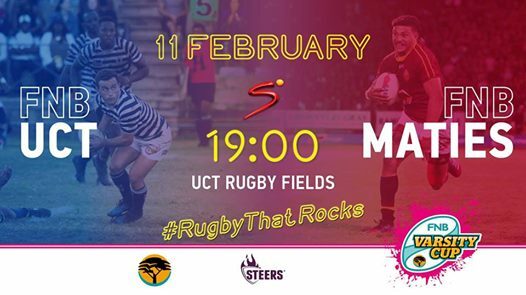 It's the FNB Ikey Tigers taking on the defending Varsity Cup champions FNB Maties! The Ikey Pub & Grind will be up and running serving you food and refreshments. UCT students: get season tickets, PLUS a 2019 Varsity Cup shirt PLUS a free drink at the Pub & Grind for R195 by signing up to The Ikey (UCT Rugby social club)! Sign up outside the game or in the Sports Centre. To avoid the long queues make sure you get to the Mile as early as possible or you are likely to miss out on the game!